Origin and Habitat: Thailand (Peninsular, South-west) and probably Myanmar (Tanintharyi) and also in Peninsular Malaysia. Altitude: Up to 700m elevation. Habitat: Lowland forest, often on lime-stone soils. It is becoming rare in the wild. Description: Borassodendron machadonis is a robust tall palm with a dense crown of large dark-green fan leaves, individual trees bear either male or female inflorescences (i.e., dioecious). As a seedling this is an exceptional palm having long petioles and nearly circular deeply split leaves. Stems: Large, solitary, to 20 m tall and 30 cm diameter. Leaves: Very large; petioles to 10 cm long, with very sharp margins; blades dark green, glosssy on both surfaces, open and split at the base to give a central triangular cleft. Blades are divided almost to the base into numerous segments, and these are again divided into about 75 long, wide, droopy leaflets. Petioles very long with a very hard, smooth and razor-sharp margin (caution when pruning or climbing). The flowers occur in groups of 2–6, enclosed in bracts. Inflorescences: Little-branched, stout forming among the leaves. Male inflorescences to 2 m long, with 15-20 thick flowering branches. Fruits: Obovoid, purplish-green to purple-black or brown, very large up to 12 cm long and 10 cm diameter, some of the largest in the palm family (not as large as a coconut, but close) and in pendulous bunches, with a fibrous pericarp. There are 3 seeds, with thick, stony walls protruding as flanges into the endosperm. 1) Forest & Kim Starr “Borassodendron machadonis (borassodendron)”. Plants of Hawaii. <http://www.starrenvironmental.com>. Downloaded on 21 August 2014. 2) Andrew Henderson “Palms of Southern Asia” Princeton University Press, 27/apr/2009. Page 37. Cultivation and Propagation: Borassodendron machadonis an easy palm for smaller gardens and adapt to a wide range of conditions in the tropics and subtropics. It is slow growing, especially as a seedling, but once established will grow fast. It is always one of the most admired palms. Highly recommended. Soil requirements: It is not particular for the soil, provided perfectly draining and fertile even if it prefers the neutral ones. However it is widely adaptable and can even thrives in poor soils, but do better when grown in nutrient-rich soils with regular watering. Avoid those soils that are soggy. Watering: It may resist short drought periods, but it profits of regular watering especially in the warmest periods. Don't let sit in water. Light: It adapts well to full sun or half sun, but seems to prefer some shade until trunking. Fertilization: Need a perfect fertilizer diet including all micro nutrients and trace elements. It is subject to potassium deficiency. Aerosol salt tolerance: Moderate, but does a better inland then it does on the coast. 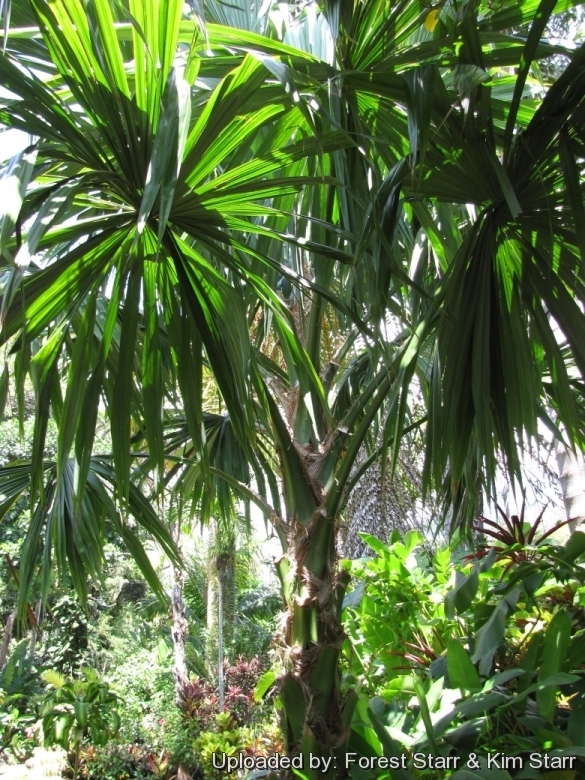 Hardiness: This is a great palm for tropical areas of the world, (USDA Zones 10-12). Minimum Tolerated Temperature is about -0 °C, or little less, just for a very short time. Wind hardiness: It can tolerate moderately windy conditions. Ornamental use: It is a most imposing palm of particular ornamental and landscape value due to the robust whitish cylindrical stems and the thick top with the large leaves; ideal for lining wide avenues, or utilized as isolated specimen or in group, in parks and very wide gardens in the tropical and subtropical climate zones. 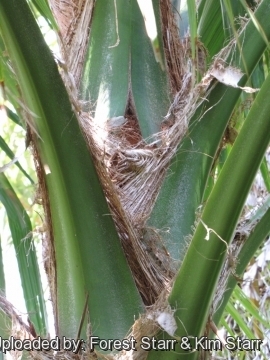 Traditional uses: The large leaves of this palm are traditionally used for thatch. Disease & Pests: It is quite resistant to pests but may require regular fertilization to prevent yellowing caused by potassium deficiencies; protect against frost. Propagation: It reproduces by seed which germinates in 2-4 months with basal heating,; the growth initially is rather slow. The seeds germinate very easily when fresh. If not properly treated, the seed does not have long shelf life.